Defensive lineman day. Stay tuned throughout for up to date forty yard dash times, reaction and news as it happens. The first group of defensive lineman posted some very fast times. Marcell Dareus in particular ran well for a 320lbs defensive tackle – posting in the 4.9’s. Ryan Kerrigan helped his stock with an incredibly fast time, as did Marvin Austin and Sam Acho. Jeremy Beal and Rick Elmore were both disappointing. Cameron Jordan impressed me the most during the bag drills and really his stock is limitless at the moment. Big personality, big potential. Christian Ballard made the most of his work out and could push himself further up the board. Chris Carter at Fresno State also performed well. Last week I mocked Jabal Sheard to the Seahawks at #25. Today he ran a 4.66 – backing up the projection. He’s stout enough to hold up against the run and he’s proven at the combine he’s got the necessary speed and size to play the LEO. It’s a distinct possibility. Robert Quinn ran a late 4.6 and a 4.7 which is fine. The problem with Quinn (aside from sitting out 2010) is not a lack of edge speed, it’s a limited repertoire of moves. He won’t be able to rely on the edge as often at the next level against better offensive lineman. The fact Cameron Jordan managed a 4.71 despite being much bigger speaks volumes. Dontay Moch didn’t get the mind blowing time but a 4.4 is still credible. He’s a difficult guy to project, I have him as a 4-3 OLB. Brooks Reed ran a blazing 4.6 and like Sheard could be an option at #25. Brooks Reed continued to impress during drills. He’s showing good foot work, foot speed and freedom in the hips to match the relentless style you see on tape. Jabal Sheard didn’t do the other drills due to an elbow injury. Robert Quinn looked a little stiff to me, as did Aldon Smith. Phil Taylor performed well on the bag drills, flashing a powerful punch, swim and great feet for a guy his size. The official times were announced shortly after with Dontay Moch (4.44) leading the way. Chris Carter (4.62), Sam Acho (4.68) and Brooks Reed (4.68) followed. Sheard posted the fifth fastest official time (4.69). The 10 yard splits made for interesting reading. Cameron Jordan (who posted an impressive 4.78) had a split of 1.69 seconds. That was actually faster than Sheard (1.70). Acho had the fastest split at 1.60 with several other posting in the 1.6-1.7 range. Robert Quinn’s 1.63 looks good as does Ryan Kerrigan’s 1.65. Brooks Reed had a 1.62, as did Chris Carter. It’s not a surprise that Von Miller and Martez Wilson posted eye catching times. Both excel with their speed and events like this are perfect for them. Wilson’s stock is rising as people wonder whether he could play 3-4 outside linebacker. I still see Miller as strictly a 4-3 OLB. Ayers’ times are a disappointment. He’s a playmaker but he’s shown quality as a pass rusher at UCLA. That time doesn’t translate to anything but a 4-3 OLB, which is what I’ve been mocking him as. He made up for slow times during linebacker drills, showing a good change of direction and great lateral movement. Justin Houston worked out with the linebackers although I think he’s better as a pure 4-3 defensive end. He needs to improve his range and run defense, but running in the low 4.6’s is good for his stock. Len Pasquarelli is another journalist reporting teams were impressed with the way Ryan Mallett handled himself this week. And that’s all that matters. Da’Quan Bowers didn’t work out today and he explains why to the NFL Network. He’s an impressive guy who had a sensational 2010 season. I can’t see him getting past both Carolina and Denver. Robert Quinn had the opposite situation – he did work out, but didn’t even take the field in 2010. You can watch back the defensive lineman running the forty yard dash here. The quarterbacks, wide receivers and running backs will go through drills today. I’ll be following events and updating the blog throughout the day as news comes in – whether it’s numbers, thoughts or breaking news. Blaine Gabbert is the only quarterback who will not throw and Ryan Mallett was the only player at his position not to run the forty yard dash. It’s not a big surprise that Mallett chose not to run, it’s not a strength and wouldn’t have a positive impact on his stock. Jake Locker and Colin Kaepernick both ran well as expected. Gabbert also looked pretty fluid despite looking a lot bigger than the other quarterbacks out there. Locker was later credited with a 4.59 official time, identical to Cam Newton. Kaepernick was officially timed at 4.53 and Gabbert at 4.62. Ryan Mallett looked good throwing the ball – a point made by TFY’s Tony Pauline. It’s not a big surprise. Throwing in shorts under no pressure should be perfect for Mallett to flash his talents. Generally all the big names performed well in the throwing drills but it’s difficult to take too much out of it given the unnatural environment. Blaine Gabbert sat out drills. Julio Jones stole the show with two excellent times. He made major improvements at Alabama in 2010, showing a greater consistency and concentration level. His numbers were impressive given ‘Bama’s preference to run. I just wonder how those times will impact this receiver group. Leonard Hankerson and Jonathan Baldwin also made some waves in the 4.4 range. Jones later made an excellent 11’3″ broad jump. Cam Newton will be among those running in group two. 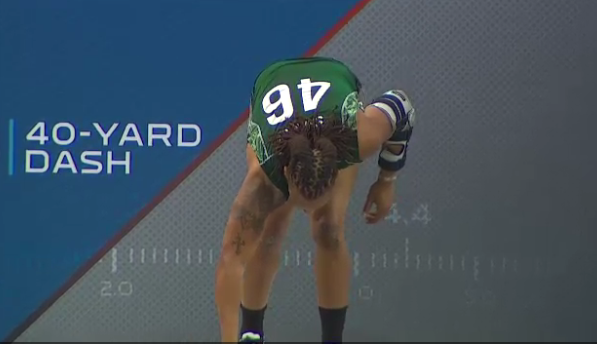 He just registered a 10’6″ broad jump. Adam Schefter is reporting that the Seahawks interviewed Cam Newton this weekend. Cam Newton ran a very impressive time in the laye 4.5’s. Let’s not forget he’s 6-5 and 248lbs, considerably bigger than most of the other quarterbacks at the combine. The Auburn QB was later given an official forty time of 4.59 – the same as Jake Locker. Tyrod Taylor was the fastest timed QB with a 4.51 official time. Christian Ponder was timed at 4.65. DeMarco Murray ran a surprisingly high 4.38 to begin. That’s an impressive number for a guy who can do a bit of everything in the backfield. If he ran a bit harder, he could be a s0lid round two pick. Roy Helu also ran well and should be a solid mid round pick. Da’Rel Scott has some potential bat ball security is a big issue. Mark Ingram’s time wasn’t unexpected, but neither was it good enough to really blow up his stock. I really liked watching Jordan Todman on tape and he managed a time in the 4.4’s. Brandon Harris (CB, Miami) was measured at 5-9 today, despite being listed at 5-11 in college. That’s almost certainly taken him out of contention for Seattle. Todd McShay and Kevin Wiedl combined for an interesting piece on how the CBA negotiations could impact the draft. If you want the #1 reason why the Seahawks would want to re-sign Matt Hasselbeck, this is it. They have no means of bringing in a veteran replacement because of the free agency lockout. Trying to force a pro-style scheme on a rookie in a fortnight is illogical. Hasselbeck’s value may be lower these days due to age and performance, but he has some degree of value to Seattle in that if preparations cannot take place as normal he can step in and play. It won’t stop the Seahawks drafting a rookie QB, but it makes it highly unlikely that player would start in year one – leaving the Seahawks with very few alternatives to what they had in 2010. Bob Cunningham has a good article on the media attention surrounding Ryan Mallett which has been nonsensical at times. Funnily enough a day after getting slammed in the media for a perfectly managed press conference in difficult circumstances, Mallett got rave reviews for his Sunday work outs at the combine. The NFL Network highlights Cam Newton, who participated in all drills today. Newton also spoke to the network to review his performance. Ryan Mallett discusses his day’s work out. Mike Mayock provides a scouting report on Jake Locker. Stephen Paea (DT, Oregon State) set a new record for the 225lbs bench press with 49 lifts. Incredible. His value comes as a run defender and his pure strength makes up for a lack of real size. Phil Taylor (DT, Baylor) managed 31 reps. His stock should rise after this weekend. The offensive lineman and tight ends have been running drills today. More on that in a moment, because it’s taken a back seat at the combine. All the headlines have been provided by Cam Newton and Ryan Mallett who gave interviews ahead of their work outs tomorrow. Here is a link to Newton’s ‘opening statement’ where he read a prepared speech on his recent comments about being an ‘icon’. I had no problem with the words Newton used and feel it’s a shame that the combine has come to this now. No personalities please, just robots churning out the same scripted answers. Yes this is a job interview, but it’s also just a bunch of guys working out in order to play football for a living. The hype and nonsense that blew up in reaction to what can only be described as a cocky yet harmless throwaway remark is astonishing. Nobody forced Newton to make that address, but no doubt someone would’ve brought it up anyway. A shame for me, because brilliance stands alongside confidence. But it’s Mallett who made the biggest waves. He abruptly ended a press conference after one too many questions about off the field rumors. Good for him I say. The media are well within their rights to ask Mallett about reported drug use, but repeated questions are unfair considering how much is at stake here. Let the teams do their work if the guy isn’t going to discuss it. I’ve already seen numerous negative ‘reviews’ of Mallett’s performance at the podium, but how on earth can the guy be expected to handle that subject matter with the world watching? He won’t be able to dodge questions in the interview rooms, but personally I think it’s time to let the teams do their work and give the guy a break. Make up your own mind about this situation, no doubt NFL teams will. For me, the quote listed above is completely unfair. We can only guess if the rumors are true and if they are – what level of seriousness they hold. It’s a shame that a guy as talented as Mallett has seen his off season dominated by stories that haven’t really been backed up. Whereas Ryan Mallett is getting panned for his presser at Indy, reviews from some teams on his private interviews are pretty favorable. The team interviews will define Mallett’s stock. It’s a commonly used phrase – but he only needs one franchise to buy in. On a more positive note for both Newton and Mallett, I enjoyed watching this little video. It is ok to have fun at the combine too, right? Or is that a red flag these days? The NFL Network provides tape on the lineman running the forty yard dash. I stil think it’s hard to trust the forty times when a simultaneous broadcast of Anthony Castonzo and Gabe Carimi clearly shows Castonzo finishing faster, yet he clocked a slower time than the Wisconsin lineman. Bucky Brooks and Steve Wyche break down the first day of workouts at the combine. It’s a shame Will Rackley didn’t perform through injury. He’s the top small school prospect at offensive tackle. Tyron Smith didn’t run a forty, but Nate Solder managed a 4.92 which was particularly impressive. He stood out today according to Mike Mayock. Rodney Hudson carried his bigger 299lbs frame well and I’m still very high on the Florida State lineman. Here’s what he had to say after working out. For full details on the offensive lineman work outs click this link courtesy of Walter Football. Von Miller weighed in at 246lbs, which is good news for him if he performs well. Can you tell Mark Ingram has been well coached at Alabama? He speaks as well as he runs – a thoroughly impressive prospect. Larry McDaniel at With the First Pick has a nice piece on Maryland wideout Torrey Smith. Jason La Canfora publishes a top-ten mock which looks incredibly similar to fellow NFL Network reporter Michael Lombardi’s (they were sat next to each other when these were broadcast). He has AJ Green going #8 to Tennessee which seems highly unlikely to me, especially with Blaine Gabbert still on the board. I doubt the Titans aren’t going to pass on a QB to draft another wide out in the top ten, but La Canfora justifies it by pointing to the team’s addition of Randy Moss during the 2010 season. If Green does slip a bit as La Canfora and Lombardi suggest, it increases the possibility that maybe a team like St. Louis would move up to get him. That would be a great match for Sam Bradford and Josh McDaniels. It may also increase the possibility of another talented wideout falling – such as Julio Jones. The Seahawks still need to consider the position with their first round pick. Only two prospects are worth moving up for – Green and Jones. If either lingers in the teens, it could be the catalyst for a move up the board. Either falling as low as #25 (which seems unlikely) would be a gift. Work outs begin tomorrow for the offensive lineman and tight ends. Today both positional groups took on the bench press, which is probably more relevant for these guys than anyone else. Tyron Smith has a superb wing span and he’s edged over 300lbs for the combine after methodical weight gain. These things aren’t the greatest combination for bench pressing – long arms make it difficult to lift and if he’s added quick weight, it won’t necessarily translate to arm and chest muscle. Therefore, Smith’s 29 reps at 225lbs today is quite simply stunning. Top-ten pick material and by far the offensive lineman with the most potential in this class. Nate Solder has similar issues with long arms (he’s 6-8) and only managed 21 reps, which is understandable and just highlights Smith’s achievements further. Derek Sherrod and John Moffitt both benched 23 times, while small school diamond Will Rackley benched 29 reps – as did Baylor’s Danny Watkins. USC center Kris O’Dowd had an impressive 31 reps.
Two prospects I’m particularly high on – Rodney Hudson and James Carpenter – benched 27 and 23 reps respectively. Mike Pouncey didn’t participate. Interior offensive line has been a big issue for a while for Seattle, in fact ever since the ill-fated day Steve Hutchinson left for Minnesota. The Seahawks are simply not good enough at the guard position. Being able to make aditions in free agency would indicate the level of importance the front office value the position in terms of the draft. Instead we’ll go into April’s event unsure as to the team’s intentions, with no new CBA on the horizon. It’ll be hard to pass on Mike Pouncey. I often wrote on this blog during the 2010 season about his major improvents as a center for Florida after some initial concerns snapping the ball. He will start in year one at center or guard. He may not achieve the high levels witnessed by his brother Maurkice in Pittsburgh, but he will still have a fine career in the NFL and lock down a position for years (health permitting). Miami, Kansas City and Philadelphia all pick before Seattle and it’ll be something of a coup if he falls to #25. 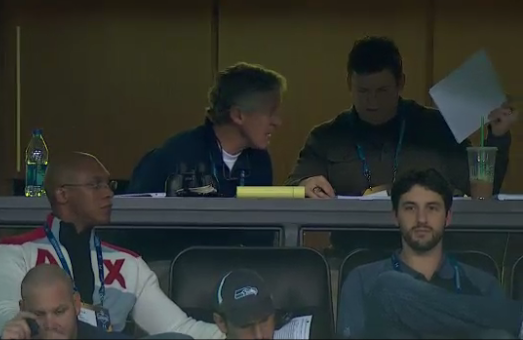 Brian McIntyre passes along information that Pouncey met with Seattle’s new offensive line coach Tom Cable this week. If the team don’t want to draft a guard in round one or haven’t the option, I still think Rodney Hudson is the best bet at #57. He’s 299lbs at the combine, he’s completely mastered his technique in college and for me he’s going to be a long term high-end starter in the NFL. I think he’s possibly the most polished offensive lineman in this class. Mike Mayock breaks down tape of Blaine Gabbert – who should remain a distinct possibility as the #1 overall pick. Jake Locker spent some time with the NFL Network crew, including the sharply dressed Mayock again in a polished waistcoat number. Michael Lombardi produces a top-ten mock draft minus AJ Green. The prospect of Green landing in St. Louis to catch passes from Sam Bradford is scary. On the plus side it could encourage a drop for Julius Jones – who is another hugely talented receiver. Elsewhere, Brandon Adams at 17 Power breaks down GM John Schneider’s combine press conference. Walter Cherepinsky’s latest mock has the Seahawks taking Jimmy Smith, which would be an absolute steal. Candice Caldwell has a twitter review on the recent NFLPA/NFL discussions. It’s almost certain a new agreement won’t be in place before the draft and this appears to be a long way from a positive conclusion. What should be an exciting time just before free agency begins is anything but. A heads up for the weekend combine coverage – work commitments mean only reaction will be possible to Saturday’s offensive line and tight end work outs. I will be watching closely work outs that take place on Sunday, Monday and Tuesday. I’d like to hear your thoughts too in the comments section. Today is technically the first day of the combine, although work outs won’t begin until Saturday. I noted the week’s schedule in full here. This is my least favorite time of the week in all honesty – a lot of hype, speculation and supposition. The work outs create nice talking points and are thoroughly enjoyable to follow, but they can’t begin soon enough. The measurements are quite interesting for offensive lineman, although most passed through today without any headlines. Tyron Smith was the biggest story as he’s worked his way up to 307lbs which is to his credit– he always had the frame to add good bulk but maintain his athleticism. I wouldn’t have any issue playing him at 295lbs in the pro’s because of his arm length and explosive lateral agility. Rodney Hudson was weighed at 299lbs, which is a further eight pound gain from the Senior Bowl. I still think he deserves a high grade as a brilliant technician and now his weight is much less of an issue. In my latest mock draft, I had Newton going first overall to Carolina. Tony Pauline’s Draft Insider blog is updated with combine information throughout this week. It’s also one of the best places for information. Gabe Carimi thinks he’s the best offensive lineman in the draft. I beg to differ – it’s Tyron Smith. I wanted to post a mock draft before the combine officially gets under way tomorrow (work outs begin on Saturday). I’ll make an update next Wednesday when it’s all finished. I suspect that a great deal won’t change but there are several prospects who can help or hinder their stock. Robert Quinn is one of those guys. He’s getting a good press at the moment largely because Mike Mayock is talking up his 2009 tape (which admittedly is impressive). However, he hasn’t played for a year. A striking performance will pump his stock back towards the top ten range, but anything less than that and the concerns may surface. I suggested a fall in last week’s mock and that’s still a possibility. There’s an opportunity for prospects like Ryan Williams or Mikel LeShoure to push themselves up the board by running strongly. Several pass rushers can impress with a good work out. Perhaps the player I’ve highlighted the most on this blog is Colorado cornerback Jimmy Smith – he can confirm a top 10-15 grade over the next few days. So what about the Seahawks pick this week? It’s changed again as we continue to review different options. More on that in a moment. I was going to post a second round projection here but opted against it. I looked across the picks and just felt it was too convoluted. Trying to project the order of the top 64 prospects is like trying to pick the lottery numbers. You end up basing judgements entirely on needs. It doesn’t mean there won’t be a second round compilation in future, but I don’t want to put something out there I didn’t feel was worthy at this stage. Ryan Mallett, Muhammed Wilkerson, Mikel LeShoure, Ryan Williams, Quinton Carter, Rahim Moore, Martez Wilson, Titus Young, Drake Nevis, Rashad Carmichael, Jonathan Baldwin, Derek Sherrod, Aaron Williams, Jarvis Jenkins, Dontay Moch, Cortez Allen, Rodney Hudson, Christian Ballard, Davon House and Ben Ijalana. I was undecided on a handful of prospects. Obviously some of these names will rise or fall and others will come into contention. What I take out of this is the 22-32 range in round one isn’t a great deal stronger (if at all) than a good half of round two. Jabal Sheard isn’t even someone I’ve had in round one before. I’ve long viewed him as a very solid round two pick having enjoyed an impressive 2010 season on a largely disappointing Pittsburgh team. For me there are two areas of strength in the bottom end of round one: defensive end/pass rusher and offensive tackle. We could see the 21-32 region dominated by those two positions. I remain unconvinced that right tackle will be a serious consideration for the Seahawks at #25, but clearly improving their interior offensive line would be welcome should a prospect like Mike Pouncey last until #25 (which I think is highly unlikely). Out of the prospects potentially available that could be drafted, my favorite offensive tackle would be Derek Sherrod. Anthony Castonzo is a finesse player who I’m not convinced would suite the right hand side of the line. His struggles with leverage don’t translate to a dominating run blocker. Gabe Carimi is limited in that I don’t feel confident he could play left tackle well enough should Russell Okung suffer further injuries. Sherrod could work as a credible run blocker and has the lateral speed/agility to play the blind side if required. It’s still a luxury for a position that doesn’t contain a high end value, watches the quarterbacks front view, gets a lot of tight end support and isn’t generally drafted that often in the first round. We’ve long discussed whether the team will value LEO pass rushers highly enough to draft one in round one. Seattle found production from Chris Clemons and Raheem Brock in 2010, although most of their pressure (and sacks) came when the defense used a blitz package. Not relying on the blitz to create pressure will significantly boost the team’s defensive production. I still think bolstering the interior (NT, 3-tech) and left end (5-tech) positions will help create better one-on-one match ups on the edge for the LEO, but I cannot rule out the team falling for a talented pass rusher if they stay at #25. Sheard looks bigger than his size suggests (6-4, 260lbs). He’s capable of holding up against the run – an under rated quality for the smaller LEO right end. You’re not going to see the blistering speed of a Robert Quinn off the edge, but Sheard has a much greater repertoire of moves and he’s a notch faster than the likes of Brooks Reed and Ryan Kerrigan. I chose Sheard instead of Justin Houston for that greater ability against the run and due to Houston’s reliance on edge speed. He’s a better technician and that will help as a rookie coming up against assured veteran lineman. Houston can’t be ignored here – he has a good skill set for the 4-3 scheme and he’s got the size and quicks for the LEO. His run defense and inability to mix things up could count against him, but he should find a home in round one. Is it a wildcard? Sure. I like Sheard enough to put him in this bracket. Can he run well enough at the combine to justify this level of faith? We’ll find out on Monday when the defensive lineman and linebackers run through drills. It’s still a chore to have the Seahawks passing on Ryan Mallett, someone who I believe deserves a lot more credit than he’s getting. Out of this quarterback class, he’s probably the most ready to start from day one and in fairness I think that would still be the case even if Andrew Luck had declared. However, we all know the character concerns by now and how different teams react to them. When I look at the ‘all-in’ slogan of this regime and the way it’s being set up – can I see Mallett as the focal point of the Pete Carroll era? It doesn’t seem like a logical fit. Maybe I’ll be wrong there – part of me hopes that I am because I rate the guy higher than most. ESPN reports that Cam Newton will conduct a full work out at the combine. The quarterbacks will run through drills on Sunday. Tony Softi at ESPN 101 St. Louis is dragging up the Ryan Mallett ‘drug’ speculation again. It’s a tiresome story now because everyone was already aware of these rumours. Now it’s up to the teams to do their homework and get on with deciding how true they are or how much of a concern it is. Gil Brandt believes Newton will be the first overall pick. I agree. In fact, I’m beginning to believe it’ll be a near certainty. Mike Mayock doesn’t think Robert Quinn will suffer a draft day fall, as I reviewed in my latest mock draft. Bucky brooks says the combine will be crucial for this year’s quarterback class. Todd McShay and Mel Kiper preview the combine in their latest ‘First Draft’ podcast. Mel and Todd also run through their ‘final analysis’ in the draft lab. We’re still waiting a logical reason as to why they’d be discussing the draft in a laboratory. It’s the week in which the scouting combine technically begins, although the all important work outs won’t begin until Saturday. This means a lot of talk about who can improve or weaken their stock over the next week or so. People want to know who’s going to run a super-fast forty yard dash and be the talk of the week. People want to know who will master the drills and bench the most. Who will perform well during interviews? I enjoy the combine because it creates fresh talking points at a time when you can only read so many three paragraph scouting reports. You watch the tape during the season, we diagnose it in detail during the lull up until the combine and then we try and work out what’s going to happen. Even so, I don’t think that much changes at the combine with only a few exceptions. The prospects you expect to run fast inevitably do. The guys who run faster than anticipated get a good write up but then we go back and watch the tape and you realise why you graded them poorly in the first place. Even the prospects who under perform can rely on good tape to bail them out. There’s a cycle to the process and something of a predictability to it also. In 2009 Chris Johnson (a R1-2 prospect) ran an official 4.24 forty yard dash and tied the second best time ever recorded. He went 24th overall, which wasn’t a dramatic rise given his achievement. During the same year, Andre Smith made a complete mess of his combine – originally saying he would be present but then pulling a n0-show. He ran a decidedly awful (shirtless) forty yard dash at his pro-day. Despite a mountain of criticism not only about his off season conditioning, but also serious questions about his ability to even play tackle in the NFL, he was still drafted 6th overall. Two prospects with very different combine experiences who actually didn’t adjust their stock all that much. I decided to look back at last year’s event and see who was reported to have helped or hindered their stock. Many people expected Oakland, with their reputation, to select Campbell in the top-ten. The tape painted a very different portrait of Campbell – he looked uneasy with poor technique and didn’t play like a dominating athletic freak. The Raiders did draft Campbell, but almost one hundred places lower than everyone expected. He was taken in round four with the 106th overall pick. We hear a lot about how interviews can influence a prospects stock and that is largely true. I think it could define Ryan Mallett’s 2011 NFL draft and could play an integral part in many other prospects’ hopes of being high first round picks. However, as with Smith previously there were a lot of concerns raised about Rutgers offensive tackle Anthony Davis last year. To some degree he was the opposite of Bruce Campbell. In Davis’ case the tape shone through and he was drafted 11th overall by San Francisco. Another example of combine hysteria was the case of Joe Haden, who ran a very poor time in the 4.6 range. That was considered a stock killer for a cornerback who played much faster on tape for Florida. He was still taken 7th overall by Cleveland and enjoyed a very productive rookie season. Closer to home many were surprised and subsequently impressed by Golden Tate’s work outs, including an eye catching 4.42 dash. It didn’t translate to draft stock as he nearly slipped into round three. Taylor Mays ran an incredible forty time considering his running style was unorthodox, but he couldn’t repair criticisms about his tape during the season and Senior Bowl. This should be an event for running backs to really impress with their speed and movement, but that wasn’t the case last year. Pauline listed Anthony Dixon, Jonathan Dwyer, Joe Starks and Joe McKnight among his draft risers last year following work outs (yet didn’t list C.J. Spiller, an eventual top ten pick). The first three runners in that quartet were drafted in round six – with all three suffering somewhat of a surprise drop. Joe McKnight was once considered a borderline R1-2 prospect but fell into round four. Clearly off the field issues played a part in his drop to round four, but these were not picked up on during the combine by the national media. So while it’s generally a very entertaining watch and does create a lot of interesting talking points, I suspect a lot of big decisions that are made we’ll never learn about until the draft actually takes place. At the same time a lot of those decisions will be based on tape and not what a guy does in shorts and a t-shirt in an unnatural environment. It’s often considered a negative for quarterbacks to not throw at the combine (and very few top prospects do now) but I think it’s completely understandable and it never seems to hamper their stock. They won’t be throwing without pressure to guys they’ve never met either in training camp or on the field, so why should they in Indianapolis? What can scouts actually learn from those work outs that they can’t discover on tape? How many times will a prospect need to side-step a static sand bag or run in a straight line without pads? How many times will they have to catch several different footballs, all the while dropping rapidly dropping each one in preparation to catch the next? Unmissable entertainment, but really entertainment is all it is. Each positional group is broken down and begin their combine on different days, going through four different stages. The event begins on Wednesday 23rd February, when Groups 1-3 arrive. Groups 4-6 arrive on Thursday, Groups 7-9 on Friday and Groups 10-11 on Saturday. Day One includes arrival, registration, X-rays, pre-exam, orientation and interviews. On Day Two the measurements take place along with further exams, pysch tests and interviews. This is also when prospects will begin speaking to the media. Day Three involves a NFLPA meeting, even more interviews and for the kickers, punters and special teams prospects – they will hold their work out. For the rest the work outs begin on day four with positional drills and all the usual stuff before departure. Group 1 (K, P, ST, OL), Group 2 (OL) and Group 3 (TE) – begin their four day trial on Wednesday 23rd February. Group 4 (QB, WR), Group 5 (QB, WR), Group 6 (RB) – begin on Thursday 24th February. Group 7 (DL), Group 8 (DL), Group 9 (LB) – begin on Friday 25th February. Group 10 (DB), Group 11 (DB) – begin on Saturday 27th February. What it all means is you can see the offensive lineman and tight ends work out and go through drills on Saturday. We’ll see the quarterbacks, running backs and receivers work out on Sunday. The defensive lineman and linebackers get to work on Monday and the defensive backs finish things off on Tuesday. If a quarterback gamble is inevitable, why wait? It’s usually paired with the assumption that next year’s class will be better. I haven’t followed a draft where I haven’t seen or heard this opinion somewhere. Last year’s class of quarterbacks was perceived as a poor one because the depth wasn’t good after the top talent – Sam Bradford – left the board. In 2011 it’s a supposed weak group because there’s plenty of depth, just not a bona fide #1 pick like the one selected by St. Louis. I understand why the ‘weak class’ argument is made annually because whether you’re a fan or a pundit, everyone appreciates the importance of the position. Ideally you not only want someone who can win you football games, he also has to have good technique and all the off the field intangibles. He will be the face and identity of the franchise. People want their QB’s to be more like Peyton Manning than Ben Roethlisberger, even though the latter has two Super Bowl rings. It’s easy to get behind drafting a Sam Bradford type quarterback. He says all the right things during interview – the answers are pretty dull, but that’s ok. He’s a student of the game who you just know spends hours watching tape while the rest of his teammates are winding down. He’s in the facility almost as long as the coaches, if not longer. On the field he’s a pure talent with everything you look for – accuracy, a capable if not elite arm and he makes good decisions. It’s easy to assume that at some stage in his career he’ll win a Super Bowl for St. Louis, or that they will at least contend for one. The problem is, prospects like that are always destined to go first overall unless the team making the pick already has a legitimate starting quarterback. If he’s the one defining quarterback prospect in the draft does it make it a weak class? Not for the team picking first overall. The team’s who may need a quarterback in the 2-32 range however have cause for complaint. In that sense 2011 is a better year for those teams because there are four potential first round prospects – Cam Newton, Blaine Gabbert, Ryan Mallett and Jake Locker. None are as highly rated as Bradford, but certainly all have reason to be drafted in the first 32 selections. Seattle finds itself in a unique position because they are a team that would be picking much higher but for a history making 7-9 playoff appearance. In reality you will never find a Sam Bradford type quarterback with the #25 pick. Last year Tim Tebow was taken with the very same selection by the Denver Broncos. He was far from a flawless player and clearly the Broncos (or at least Josh McDaniels) bought into the ‘Tebow factor’ and hoped his driven determination to improve would solve some of his technical problems. That’s the type of gamble that presents itself when picking a QB late in round one. The fact there isn’t a Sam Bradford type quarterback this year is irrelevant to the Seahawks because they don’t pick high enough to wonder whether they’ll have a chance to draft them. On the other hand, the depth at the position offers at least the option to solve the team’s biggest long term question mark even if they ultimately decide to pass. Many will consider the prospect of drafting a guy like Ryan Mallett as unfavorable. He doesn’t come across even half as well as Sam Bradford does and the negative euphoria surrounding him these last few weeks may leave permanent damage to his stock. No doubt people will say, “wait till next year.” I’m not a fan of that line of thinking. Clearly the team should not feel forced to draft ‘any’ long term option at quarterback. The Seahawks aren’t going to plough in carelessly ready to make a colossal gaffe on a player they aren’t fully convinced with. Neither will they be entertaining thoughts of next year in their decision whatever it may be. The Seahawks’ intentions must be to select in the 20’s or 30’s every year. If they do so, it will mean the team has qualified for the post season year after year. In order to achieve that they will have to address the long term future at quarterback – a situation of great urgency now that Matt Hasselbeck is a free agent-in-waiting and will turn 36 in September. We can look ahead to next year and acknowledge the possibility of both Andrew Luck (Stanford) and Matt Barkley (USC) declaring. We can also anticipate that both will be top 5-10 picks with Luck almost certainly the #1 choice. Seattle would have to be a 0-3 win team to have a shot at Luck and maybe also Barkley. Considering they play in the weak NFC West I’m not entirely sure that’s even possible. It was quite some achievement for St. Louis to be bad enough in this division to select first overall – something the Seahawks should strive to avoid even if the prize is a shot at Luck. You end up coming back to a guy like Mallett, because that’s the type of player we’ll be discussing if Seattle succesfully maintains their place atop the NFC West rankings. He doesn’t have all the intangibles you look for, but he’s still clearly a talented quarterback. Mallett’s football IQ is among the best I’ve scouted but it’s not often discussed simply because – to put it bluntly – he doesn’t come across in such a positive way with his body language and during interviews. Christian Ponder is established as a very bright and intelligent individual off the field and I’ve lost count how many times I’ve heard people credit Ponder’s game intelligence because of this fact. It’s a mistake because his decision making is often terrible and he’s much more erratic than Ryan Mallett. For me the bigger gamble would be to draft Ponder any higher than round five and expect him to work out as a starter than it would be to take Mallett in round one and work on the ‘intangibles’. While ever the Seahawks enjoy success (and even at 7-9, winning the division has to be classified as such) they will almost certainly have to ‘take a chance’ on a quarterback one day. That will be the case whether it’s Charlie Whitehurst, a round one pick, a mid/late rounder, a free agent or trade. They will not find a flawless diamond a la Bradford, Luck etc without experiencing one of the worst seasons in franchise history. The argument of ‘waiting till next year’ can only be classified as an admittance that the team cannot hope to achieve the status of picking in the 20’s again. The same problems will exist next year, only Hasselbeck will be a year older and it’s not obvious we’ll see the same level of depth at the position. Taking a chance on someone might be inevitable. So why wait?